The 2017 default theme is here, plus: inclusive design, editing tools, Swag Store, and must-follow sites. You’re off to a strong creative start in 2017! Here are a few recent updates and stories from the WordPress.com community in April that we wanted to share with you. The Independent Publisher theme has long been beloved for its simplicity and legibility, and we’re happy to announce that it has been improved, ever so slightly. Read our interview with the designers, Caroline Moore and Kjell Reigstad. Longreads is rapidly becoming the best place on the internet for personal essays, and there are ambitious plans to do even more. Read more on our plans, and contribute to the Longreads story fund — WordPress.com will even match your contributions. Better conceptualizing, designing, building, and improving how to meet the needs of underserved users is a core part of how we work at WordPress.com, and that was the focus of April’s Design and Exclusion (#DesignX) conference (check out the complete video and transcript at x.design.blog). How can we help entrepreneurs working in cities around the world? That’s the challenge Hajj Flemings explored in an April essay for Design.blog. 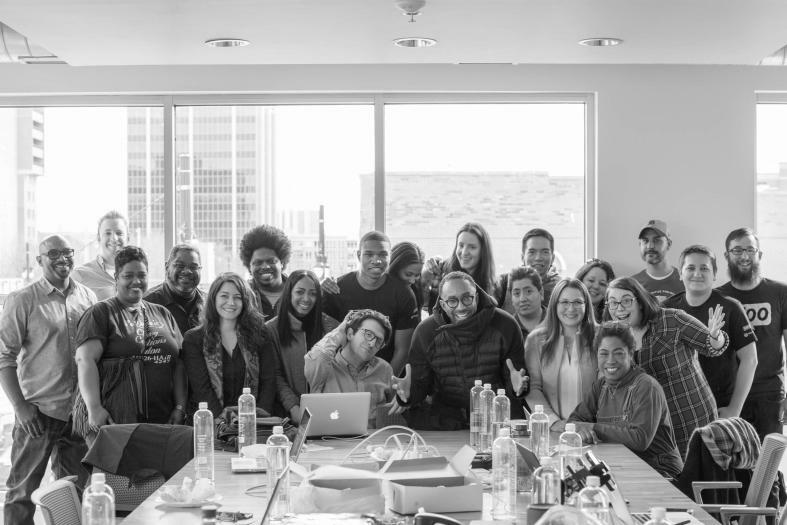 He shares some of the insights which came out of the 100 Project Hackathon — a project tasked to build nine small business sites in a 48-hour period in Detroit. Two Aprils ago, Quintin Lake set off from St. Paul’s Cathedral in London. The journey? To walk 10,000 kilometers around the coast of Britain. We caught Quintin just before he embarked on a 15-day adventure around the edge of Snowdonia, North Wales. Read about Quintin’s epic walk along the sea. Quotables: “If you really love writing, it’s like eating. You can’t live without doing it.” – The writing life of Harvard historian and New Yorker staff writer Jill Lepore (Harvard Gazette). Case Study: A collection of portraits, street scenes, and details from Bangkok. Try it out: Importing Google Docs → WordPress.com. “WordPress was the best… I’m very happy to be back.” — welcome back, Leo Laporte! Check out Amazon CTO Werner Vogels’s new site, Werner.blog. Hang out with us on Instagram and tag your ‘grams with #DiscoverWP. What did you love about your own work in April? Comment with a link to a post you’re proud of, or something new you learned about designing your site. Feeling motivated? Download the WordPress app on iOS and Android. Here’s some of the awesome stuff going on at WordPress.com. This is great. I particularly like the blog about walking around the U.K.
I’m proud of developing my creative writing craft this spring, and there’s still just time (deadline April 30th) for feedback on this draft of my submission to an anthology, all constructive criticism welcome! On April 9, 2017, I saw a blog post about two of the records that my blog had set a few days earlier. One day, my blog got viewed 43 times in one day … and, back in March, my blog got viewed 167 times in one month. I felt great whenever I wrote that blog post. I am glad to announce that I am truly appreciative of the help I received from the WordPress staff. I have been trying to upgrade the content of my blog and enhance the look. When I had problems with the wordas program the WP staff responded quickly through the chat thingy. Yay! This month, I have noticed more traffic because I’ve been posting more. Also, I have become more familiar with setting up my categories and pages. It’s a work in progress. The past couple of years have been a nightmare and my writing suffered. At one point I hadn’t posted something for almost a year! I wrote 2 stories this month that reflected my state of being. One is serious and the other one is mildly amusing. 2 posts in a month??? I was over the moon to get that first one out! So, 2, is an achievement!! Discovering ‘Giving back’ on Community Pool and First Friday has been a real pleasure. I’ve found some great content and hopefully helped some bloggers too. And WP Blog has introduced me to the new theme: ‘Publisher 2’ which I’m planning to try out and give my blog a spring clean and make over. I’ll be checking Lake’s blog for sure as I’m a keen TV docos viewer about Britain’s wonderful coasts, the latest being with actor Robson Green (started last night). Hi I have been working on my blog and have a few questions. I have a free blog but what do I do to create a new domain? I have no idea and all this is so confusing? Do I upgrade a domain? Do I move my website to a new place like hostgator? Thanks for the help. I’m not an expert at WP but I have a bit of info. When you click on the ‘My Sites’ button (mine is at the top left of my browser) it should take you to the administrative section of your blog. There you’ll see a menu that includes Stats, Plan, Blog Posts, Pages, etc. Further down on that menu, is an option that says ‘Domain.’ If you click there, WP will guide you through choosing a personal domain name (it can end it .com, .org, .biz, .blog, etc.) and setting up a custom email @ that domain as well, if you wish. There are payment options and you just provide your card information. G Suite and WordPress have made it pretty simple. Hope that helps! Thank s Faith but what happens if I want to site with a store and all. I an Afrikaans speaking and writes mostly in Afrikaans. In April I did two English blog posts and enjoyed both of them very much. April has been a wonderful month on WordPress. I participated in several of the weekly photo challenges through the Daily Post and joined in on the Community Pool page. Getting to interact with other bloggers is so rewarding and I appreciate all of the tools to connect that WP provides. Cheers to you admins for the hard work! This piece that I wrote a few weeks ago is one that I feel proud of: http://wp.me/p2yrSE-Ds , but I welcome feedback on any of my posts! Thanks Margarita and all of the WordPress crew, – You guys and girls make it so easy to blog, simple, intuitive, creative and smart responsive websites, exactly what we (the customer) need and at very good value for money! Literally in love with combining my two passions at the moment writing and fitness through martial arts. I love writing books, I wrote a quick book about knowing yourself, also I continue doing my behind clapping push ups. I’m intrigued by the update to Independent Publisher. Next time I’m couch stuck I want to play around with the design and see if it can fit my site! The most important to me was your putting the toolbar on the HTML editor. This has helped me tremendously and saved no end of trouble. At first there was a heavy price, that it took ages to update, but in the past few days you have sorted that out, and I have no complaints or worries there. It is still not finished — the toolbar does not yet include special characters or colours, both of which I would like, but the scroll bar at the end that does not yet work shows that you are working on it and I look forward to the completion of that toolbar. It saves me entering into the visual editor, which does damage. I like the HTML editor very much. Thanks. Coastline” just featured here too. Other than that, I haven’t been making the rounds too much these days, so I am hopefully going to try catching up with a few blogs I follow too. even if it didn’t draw much attention. Just started blogging a few days ago and am posting my novel titled “things I should have said” in a 3 series post per chapter. I hope to get some feedback on what you think about it. http://goodnessfiction.wordpress.com Thanks.